Transition Guelph’s GROW gardens had a productive first year with plans to expand and offer more opportunities for community members in 2017. GROW is a volunteer maintained, food garden located at Grace Community Church (http://www.gracecommunity.ca/). The garden is just north of Guelph on the Marden Road. Grace provided Transition Guelph with a rent free section of their property to develop a garden that can serve the local community. The project began as part of the Back Share Sharing Program and Mike Barber has been coordinating the effort since its conception. According to Mike “the goal of the GROW garden is to provide healthy, organically grown vegetables and fruit for local individuals and well known emergency food cupboards and drop-in centres, while educating those who have an interest in growing their own food”. GROW has managed, with limited funds, to create a 2500 square foot fruit and vegetable garden, plant their first row of fruit trees in an expanding orchard, plant a pollinator garden, and start a perennial vegetable area with rhubarb, asparagus and a few other plants. Next year, GROW plans on building an open air learning space and a tool shed/water catchment system. GROW is also expanding the garden’s footprint and orchard. According to Mike Barber ” the long term plan is to provide free workshops on everything from canning and seed saving to beekeeping. GROW volunteers have a wealth of knowledge and are happy and willing to share them time to help others gain new skills.” Volunteers are always welcome and their will opportunities for gardeners to help with the community plot as well as have space to grow their own vegetables. Look for more information about the GROW gardens in the spring of 2017. Guelph Tool Library will have its second Repair Cafe on Sat Dec 3rd at St James the Apostle Church from 9 to 1! There will be volunteers who will help to fix toys, Christmas ornaments, clothing, jewelry, electrical appliances, etc. There will also be a holiday gift swap events! This is a free event. The Guelph Tool Library is presenting Guelph’s first Repair Café. The Repair Café will take place in the morning of Saturday August 20 at St. James the Apostle (86 Glasgow Street North, Guelph). A Repair Café is an event where people volunteer to try and fix broken items. Stations will be set up in the hall and outside with volunteers offering to fix damaged items or provide advice about next steps. Tables will be set up for repairing jewellery, simple sewing fixes, small appliance repair, and bike repairs. Volunteers from the University of Guelph Bike Club and Transition Guelph will be among the people helping out. Tool Library Coordinator Susan Carey said “It is a fantastic project to bring to Guelph. Repair Cafés offer a chance to repair a favourite item and to keep it out of the landfill”. 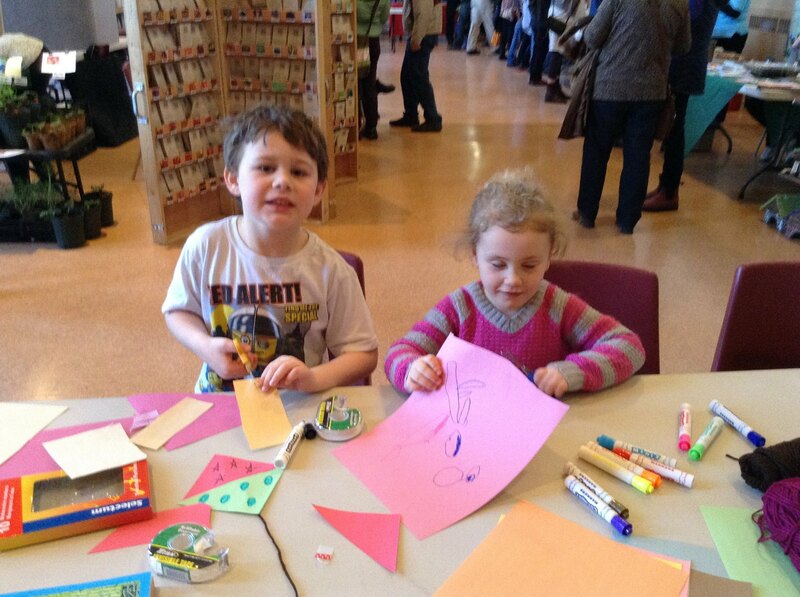 The Repair Café will also offer a Swap Table. Participants bring an item in good working order that they no longer need and swap it for something of equivalent value. The table is a unique way to share items and reduce the amount of waste going into the landfill. Finally, the Repair Café will be a chance for the Guelph Tool Library to promote itself and to sell memberships. The Guelph Tool Library will also be accepting donations of gently used kitchen appliances, gardening tools, and hand tools. Location: The site search has ended and we have officially found our new home!! We are located at 123 Woolwich Street, Guelph, ON. Memberships: Our website is up and running, which means you can become a member. Visit https://guelphtoollibrary.myturn.com/library/ or come to our open house this Saturday, July 16th to join. Tool Donations: We have received many gracious donations of basic garden tools, but we haven’t received much kitchen related inventory. A list of things we could use is listed at the end of this update. Please spread the word! Repair Cafe: We’re hosting our first Repair Cafe on the morning of August 20th at St James the Apostle Church. You can bring in a broken household item and ideally, get it fixed! There will be various repair stations: electrical items, jewelry, zippers, clothing, furniture and wooden items, etc. The CSA Bike Centre will be there for minor bike repairs and maintenance. There will also be a locally grown salad buffet brunch, tool library donation drop-off, swap tables and info displays. More info to come! Volunteers: Yup, we’ll need them. Interested? Email us and I’ll add you to our list. We believe in giving volunteers interesting and creative tasks. Write-ups of volunteer positions are in the works. 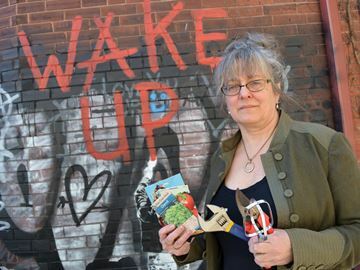 Susan Carey, chair of the Urban Food Working Group at Transition Guelph, holds some of the hand tools, kitchen tools and seed packs soon to be available as part of the organization’s latest projects. Susan Carey wants you to take a moment to consider the inch of dust collecting on the mitre saw in your basement. While you’re at it, ponder the waste-of-space wheelbarrow in your garden shed; or the rototiller you’ve always wanted but couldn’t justify buying. By the way, did you to know the average lifetime use for a power drill is only 13 minutes? In other words — you don’t need a drill, you need a hole in the wall. Transition Guelph, thought about these and other realities as she and co-conspirator John Dennis discussed the possibility of launching a tool library over the last year. What’s a tool library, you ask? It’s a library where you borrow tools instead of books. Instead of forking out $200 for a reciprocating saw that will end up gathering dust between uses, you could join a tool library and get the tools you need, when you need them, at a fraction of the cost. Many who buy into the concept end up donating tools to free up space in their homes. “It’s such a good fit for this town,” says Carey, who was inspired by Transition Guelph’s mandate to build a resilient and sustainable community. It’s also a good fit for Transition Guelph — the eight-year-old, not-for-profit organization that has spawned innovative projects like urban farm tours, a seed exchange, a community orchard and the Urban Sugaring Project, which loans out buckets and taps for residents to collect sap and participate in a communal boil-down of maple syrup. The tool library concept grew from Guelph’s backyard-sharing program, created to expand the inventory of backyard space available for community gardens, and the tools needed to maintain them. It sparked the idea to create a system where residents could pay a small, annual fee for the opportunity to reserve agricultural tools through an easy-to-use website, then pick them up and return them to a central location. But it’s not a new concept. The first tool library opened in Berkeley, Calif., in 1979. Today, there are close to 120 tool libraries around the world, Toronto having the second one in Canada. In Guelph, the push to launch a tool library really began to take off when Transition Guelph received a $5,000 wellness grant from the city and a $500 donation from the Rotary Club. Today, it’s nearing reality as a summer launch date approaches and donations of tools and equipment continue to roll in. Last fall, a community survey about what the Guelph tool library should include gathered 127 responses that named everything from post hole diggers to pressure canners. Since then, some of the big items added to the inventory are four wheelbarrows, a cider press and a rototiller. JD Engines has offered to donate maintenance service for the entire tool library inventory as it grows. Other parts of the project are still in the works, including securing a location, launching the website and the possibility of offering delivery for some of the bigger tools. One site being considered is the former Acker’s Furniture space on Carden Street. Other ideas have the tool inventory stored in a shipping container stationed in a parking lot donated by a local business. Guelph’s Tool Library wouldn’t have happened without help from the Toronto Tool Library and its co-founder Lawrence Alvarez, who provided guidance that included access to the lending software developed by the Berkeley Tool Library. Alvarez helped establish Toronto’s Tool Library in March 2013. It now has four locations, including an expanded location on Danforth Avenue called The Sharing Depot, which opened last week to give members access to a selection of camping and outdoor equipment, toys and games. Alvarez is unapologetic about how the idea grew from efforts around reducing consumption and reducing our carbon footprint. “We’ve had people say that this would disrupt existing business, but for me I’m always trying to look at what the world needs in 50 years,” he says. Carey says the concept has gained traction as the sharing economy grew and people looked for ways to simplify their lives. “Western society has brought capitalism to a stage in development where there is simply too much stuff,” she says, citing her own experience with the local clothing closet where they’re often overwhelmed with donations. But she doesn’t see a project like this hurting local businesses, mainly because the concept isn’t for everyone and those who use it will still have a disposable income to spend on other stuff. Carey also sees the tool library as a way to bolster community connectedness and sees complementary goals between the tool library and places like the Diyode community workshop. Another offshoot of the tool library is a plan to develop a kitchen library. That concept offers shared kitchen equipment, from stand mixers to bread ovens. Just last week, Guelph’s Urban Food Working Group hosted a roundtable at the former Acker’s building, where plans are coming together to develop a shared commercial community kitchen. “Those plans would complement the kitchen equipment we aspire to make available to the community,” Carey says. Carey hopes it becomes a “runaway project,” and sees a day when collaboration happens between Transition Guelph and the Guelph Public Library, giving every library patron access to the tool library at little to no cost. The ultimate goal of any tool library is to eliminate the economic barrier to access. So far the community has embraced the idea, and Carey’s eager to hear from even more Guelphites who want to become members. More information is available by emailing toollibrary@transitionguelph.org. Best thing you can do on Earth Day? Support the CEI. This is guest post from Evan Ferrari, Executive Director of eMERGE Guelph, one of Transition Guelph’s wonderful partner organizations. If you have more questions about the CEI and how you can help, please get in touch with me at kelly@transitionguelph.org. What’s the best thing you can do on Earth Day? Support the CEI (Community Energy Initiative) – creating a local economy that puts more people to work by reducing the pollution causing climate change. On Monday April 25 the city will make a decision on the fate of whether to update the CEI. Rarely do we get a chance to have a profound impact on the future of our city’s economy – and at the same time – improve our environment. Add your voice to update the CEI and accelerate the work to create a post-carbon economy. and producing more clean energy alternatives locally. It’s about creating more energy security within our city. By getting this right we can keep more of the half a $ billion dollars a year in energy costs that leaves the city — right here. We can do this by putting more people to work locally. And at the same time we would be creating a healthier place for our children to grow and prosper. Now nine years old, the initiative has some challenges. But an update will focus us toward a cleaner and more prosperous path forward. The Guelph CEI has been a catalyst for municipalities across the country to take charge of their own local economy. Guelph generates 50% more peak electricity locally than similar Ontario communities. We’ve done this through solar photo-voltaic, combined heat and power and by harnessing methane from the former Eastview landfill site. This amounts to 10’s of millions of dollars of local capital investment – at a minimum. And millions of dollars, every year, staying in the city from the electricity that’s been generated. Those generating systems are owned by local businesses, co-ops, institutions, places of worship and individual homeowners. We are 50% above average because of the CEI. And then there’s a new project where Reids Heritage Homes wants to work with their competitors to build an entire community of highly efficient Net-Zero homes that will be 3 times more energy efficient than the current building code. They don’t want to build a single ‘demonstration home’ but an entire community. They have been very clear that they want to do this in Guelph because of the CEI. Another downtown property -about to be renovated – is considering making their building “District Energy Ready” They’re considering this because of the CEI. Then there’s the Canadian Solar plant that employs 500 people. Canadian Solar has 10,000 employees worldwide. Their revenue in 2014: $2.96 Billion US (more than $3 Billion CAD). In 2015 they ranked second worldwide in solar panel shipments. And they chose to make Guelph their worldwide headquarters because of the CEI. At eMERGE we’re very encouraged that the CEI report is recommending a full public update. It proposes a community driven Initiative that re-engages businesses, institutions and of course all citizens of Guelph to make this a robust a plan. We encourage you to let city council know how you feel about updating the CEI in order to move towards a diversified economy that makes our community healthier and more prosperous. The last of the sap pick ups will take place next week. You can drop off your sap on Monday March 14 and Wednesday March 16 from 5 until 6 p.m. at the St. James Parking lot (86 Glasgow Street North). If your tree has stopped running, sap has not come out of the tree for three or four day in a row, please return your kits. Give the equipment a quick rinse but do not use any soap of cleaners on it. Also remember to keep your sap in a cool place out of the sun. It can also be frozen to ensure that it does not go off. Transition Guelph is pleased to be the recipient of a 2016 Rotary Club of Guelph-Trillium Community Funding Grant. The grant for $500 will be used to establish Guelph’s first tool library. The library will have tools that anyone can borrow to be a successful gardener and to properly preserve food. The grant recognizes that there is a clearly identified need for this program and provides seed money for Transition Guelph to undertake this project. We are thankful for the support of the Rotary Club of Guelph-Trillium. Click here to find out more Guelph Tool library. Transition Guelph is the recipient of a 2016 Community Wellbeing Grant from the City of Guelph. Transition Guelph was awarded $5000 to support the 2016 Resilience Festival, the Urban Sugaring Project, and the start up of the Guelph Tool Library. Transition Guelph is thankful for the on-going support of the City of Guelph through these grants.